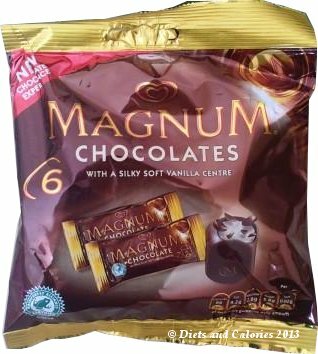 Magnum – the popular ice creams on sticks, have broken into the chocolate confectionery market with the introduction of Magnum Chocolates. Don't worry, they're not the diet busting size of Magnum ice creams. The chocolate version have just 66 calories each, perfectly acceptable as a tiny treat on a diet day. Magnum Chocolates are packed inside a cellophane wrapper which replicates the ice cream wrappers. Inside each bag are six individually wrapped Magnum chocolates. Wow, this chocolate must be something special. I couldn't wait to get stuck in. They score 10 out of 10 on the cuteness factor. I love mini versions of food, and these are just adorable. Each Magnum chocolate is a replica of the ice cream, minus the stick. The thick chocolate on the outside tastes just like the ice cream version, plus it gives that reassuring cracking sound when you bite into it. The inside is absolutely delicious. It's light and fluffy, like a soft mousse with a light vanilla taste. I could eat that stuff on its own. Of course, being so small, it's all gone in a few (teeny weeny) bites, but so worth it. They're even better if you keep them in the fridge and eat them from cold. Their nutrition label is the first I've seen on a chocolate that provides a traffic light guide in words. See photo below. If you can stick to eating just the one, then 66 calories isn't going to impact significantly on your calorie intake. But if you can't resist the whole pack, then you're looking at 396 calories for the lot. Other new mini choccies to look out for include Cornetto Vanilla Chocolate cones and Mini Milk chocolate Lollipops. Found in a Poundland store. Nutrition information per 11g chocolate: 66 calories, 0.7g protein, 6.0g carbs, 5.8g sugars, 4.2g fat, 2.6g saturates, 0.02g salt.